We offer six Belize vacation packages both to our Glovers island and to inland Belize. Many people want to stay on our island longer, because it really is the best place to stay in Belize! You will receive a discounted deal when you do two of our Belize holiday packages back to back. If you are looking for two week vacation ideas for just you, or for an all inclusive Belize family vacation, this is the place to start. For reference, our single-trip prices are in this chart – see combination discounts below. If you wish to combine our Belize holiday packages for a longer stay, we offer a special price for longer trips. Prices reflect the full discount for first-time, adult guests on combined packages. If you are a return guest, signing up for a trip on sale, under the age of 11, or traveling with a group of 4 or more, your discount is higher, see other charts below. These discounts are not available for those booking through an agent eligible for commissions, only for those booking directly, and are also not available in addition to any other discounts you may already be receiving. Note: There is a $450 deposit per person per trip to reserve your space. So for these double trips, the deposit is $900 deposit per person. Anyone who has been a guest on a trip with us before qualifies for a discount, as do groups of 4 – 12 adults travelling together. If all or part of your itinerary has been put on sale, you use these prices also. Prices below reflect the full discount for these participants on combined packages. Christmas/New Years dates do not qualify for these discounts, use regular combined package discount above. Groups of 13 – 18 guests traveling together qualify for an even larger group discount. Prices below reflect the full discount for these participants on combined packages. Any holiday date blocked for discounts does not qualify for these rates, see rates for groups of 4 – 8. Christmas/New Years dates will not qualify for these discounts, use regular combined package discount above. Kids in this age group qualify for a substantial discount. Prices below reflect the full discount for these participants on combined packages. 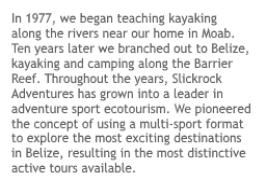 Belize Adventure Week combinations are not listed because the minimum age is 10 for this package. For regular kids rates (for single trips) visit our family vacation page. Kids pay the same as adults for Christmas/New Years dates. See adult combined package rates, above. Kids in this age group qualify for a discount on island packages only. On inland packages kids 10 and older pay the same price as adults because those packages have such a small size limit. Prices below reflect the full discount for these participants on combined packages. Belize Adventure Week combinations are not available for kids ages 7 – 9, as the minimum age for that package is 10. For regular kids rates (for single trips) visit our family vacation page.